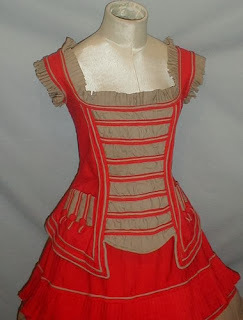 All The Pretty Dresses: Little Girl's 1870's Natural Form Era Dress, WOW! A truly magnificent young ladies 1850-1860 orange/red and tan wool two piece dress. The dress is hand stitched. The bodice is elaborately designed with rows of ruching on the front and back. 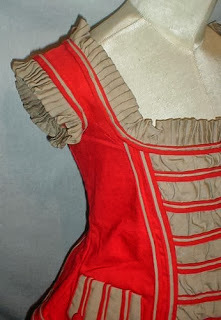 The neckline and armscyes are trimmed with ruffles. 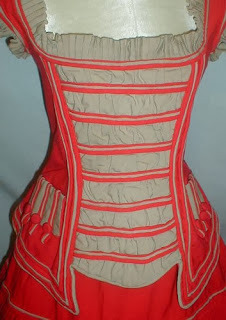 The bodice is also highlighted with rows of orange/red and tan padded cording. The two front pockets are trimmed with decorative buttons. 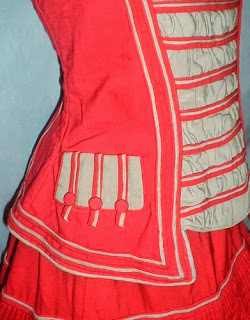 The back has a hidden red satin button closure and the outer fabric id trimmed with decorative buttons. The bodice is lined with cotton. 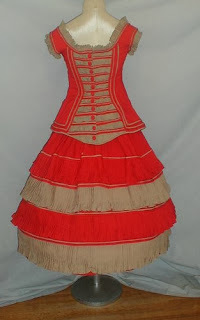 The skirt has alternating ruffles of orange/red and tan. The skirt is lined with polished cotton. The dress is in very good condition. There is no age spotting, no underarm discoloration and only one tiny moth nip at the top of the skirt near the waist area. There is a loose seam on the back of the skirt near the waist that will need minor re-stitching. A rare and wonderful Antebellum period dress. Bust 30 Waist 28 Skirt length 28 Width at hemline 84. I have no idea why the seller thinks this is from the 1850's. 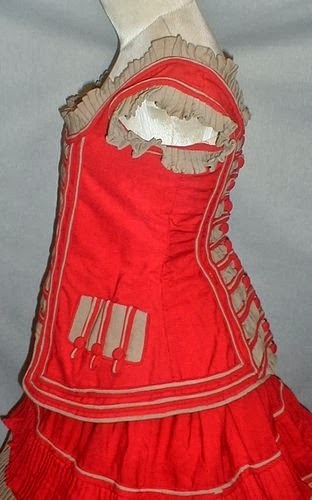 The elongated waistline, the gathered rows, the slight "fullness" to the back all indicate 1870's - 1876-1878 really. 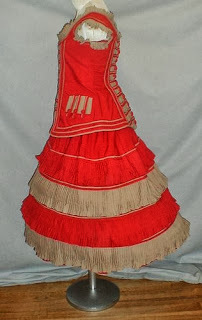 Although on an older girl and not quite the same style you can see the front of the pink striped dress is very similar to the front of this extant one.